I recently sat down with my son’s school teacher and she gave me a very brief suggestion for how to teach basic math skills to a six-year-old. She explained that they’re trying to get kids to think and count not just by ones, but also by fives and tens. She explained that they will take a number (say 38) and ask the kids how many tens go into this number, how many fives, and how many ones. I suppose it’s really division/multiplication without the kids knowing or really grasping that idea yet. The funny thing is, if you talk to kids in a certain causal way, they can actually sometimes do difficult math without knowing it. Even my 4-year-old surprises me with his ability to ‘get’ fractions. 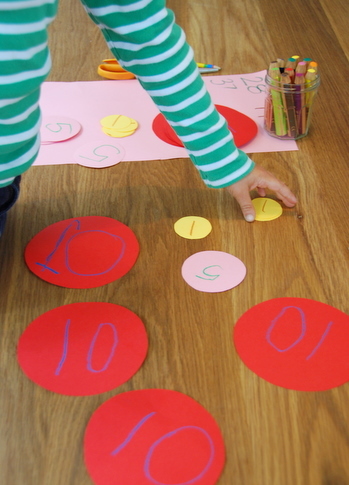 This weekend we cut out a bunch of paper circles in three different sizes, and then labeled the circles with tens, fives and ones. Then we played with the numbers, adding them up and subtracting them to reach certain numbers. 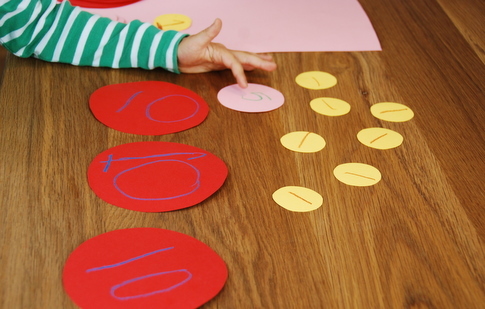 It’s such an easy project, and once you’ve made the numbers, you can keep them around for future math lessons. We brought out these numbers several times over the weekend to ‘play maths’, and the kids had no idea how much they were learning. I think motivation is really important in learning any skill including math. When I was in first grade (6-7 yrs old) my parents would give me lunch money and I was going to cafeteria where the big boys go. They would ask me what I want to have for breakfast and lunch and they would give me the exact amount. There was a long line in the cafeteria during breaks and the lady would often make mistakes when giving you change (as usual it was always less, never more ) so you would have to check on her , or you will be left without something you had in mind for the next break. I remember many times I was short a cent or two because I didn’t get the correct change last time. Of course this later on taught me some social skills , making friends and loaning those money when you need them from a friend. I’m so impressed by your boys’ math skills! I should try this too — sounds like a fun ‘game’!! And Sergiu — I love how your parents thought and trusted you to learn from ‘real life’!!! Really interesting. In the schools here I was super surprised to hear that kids are not allowed to use their fingers to count as they don’t want the kids to count by ones. I had never thought of that. Love your number circles. What a good idea! my son loves doing this with coins, same principle, 1p, 2p, 5p, 10p, 20p and 50p coins. As your boys are playing tennis now (;-)): another things my 6 year old likes to do in bouncing the ball on the racket and counting in 2s, 5s or 10s instead of ones(time tables).